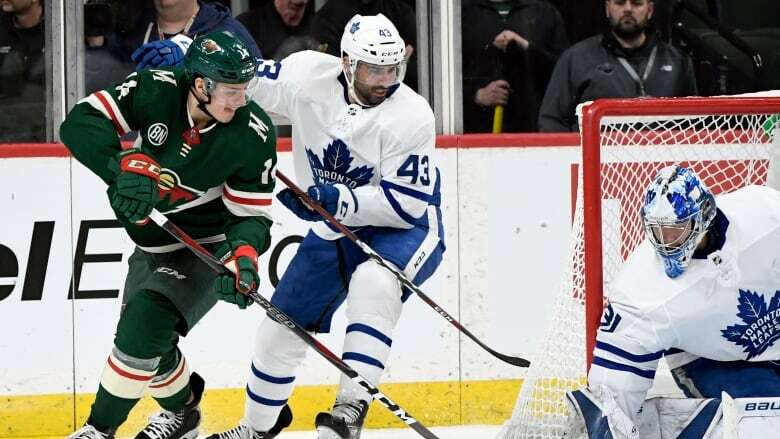 Nazem Kadri broke a tie with 3:20 to play and Zach Hyman scored twice in the Toronto Maple Leafs' 5-3 victory over the Minnesota Wild on Saturday night. The Toronto Maple Leafs keep winning, and they're adding another offensive player to the lineup. Auston Matthews also scored, and Frederick Anderson made 38 saves for the Leafs for his 15th victory of the season. The win came after news broke that Toronto signed restricted free-agent William Nylander to a six-year contract, ending an impasse with his contract. Saturday was the deadline for a deal to be done. Toronto improved to 12-3-0 when being outshot by its opponent. The Leafs were outshot 41-23 by the Wild on Saturday and 18-8 in the third period.